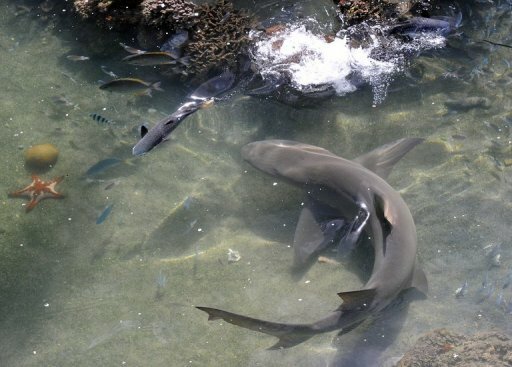 Sharks play a fundamental role in coral health say scientists studying remote reefs off Australia, September 19, 2013. Overfishing of the marine predators is also increasing reef vulnerability to global warming and disasters. SYDNEY (AFP) – (AFP) – Scientists studying reefs off Australia said Thursday sharks play a fundamental role in the health of coral, and overfishing of them made reefs more vulnerable to global warming and weather disasters. A research team, led by Mark Meekan from the Australian Institute of Marine Science (AIMS), studied the impact of sharks at the Rowley Shoals and Scott Reefs 300 kilometres (185 miles) off northwest Australia over 10 years. “Where shark numbers are reduced we see a fundamental change in the structure of food chains on reefs,” said Meekan. “We see increasing numbers of mid-level predators such as snappers, and a reduction in the numbers of herbivores such as parrot fishes. When coral dies algae grows over it, compromising its ability to regrow. Meekan said the herbivorous fishes chewed out small spaces so regrowth could take place. The study compared the impact of cyclones and bleaching events on the marine-protected Rowley Shoals, where fishing is banned, with the neighbouring Scott Reefs, where Indonesian fishermen — mostly from West Timor — are allowed to catch sharks. It found less coral and more algae on the fished reefs after a major disturbance, which Meekan said was significant as the pressures of global warming increased. “With many of the changes from a warming climate already locked in, there may be little we can do to prevent increased frequency of disturbances on coral reefs in the near future,” he said. Meekan said the findings showed that declining global reef shark populations due to overfishing was of “great concern” because it would leave the coral structures more vulnerable to bleaching events from warmer, more acidic oceans, and to large cyclones. Even small no-fishing zones in reef areas could provide valuable feeding sites for sharks, maintaining a delicate ecosystem balance ensuring that algae-eating species could thrive. A major AIMS study last year of the Great Barrier Reef, off Australia’s east coast, found that coral cover had more than halved in the past 27 years due to storms, bleaching linked to climate change and the predatory crown-of-thorns starfish. Intense tropical cyclones — 34 in total since 1985 — were responsible for the bulk of the damage, accounting for 48 percent, with 10 percent due to severe bleaching events in 1998 and 2002. The intensity of cyclones was increasing as the world’s oceans warmed. The rate of decline had increased substantially, with two-thirds of the coral cover lost since 1998. Intervals between disturbances were generally too short to allow recovery, which takes between 10-20 years. According to the team their shark study, published in the latest edition of peer-reviewed scientific journal PLOS ONE, had offered a “unique opportunity” to isolate and examine the impacts of sharks on an entire reef ecosystem’s health in a way not attempted before.